I love to read. It is my second passion, my first is quilting. There are also a few great magazines that are "must have's" in a quilters library, I have made a few suggestions at the bottom of this page. I feel is worth taking a second look at. I love scrap quilts, and this book has several which I would actually make! 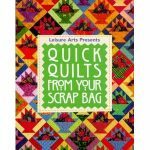 It is “Quick Quilts from your Scrap Bag” and is published by Leisure Arts. It's a good investment for under $16. I recommend it as it is a very practical book. 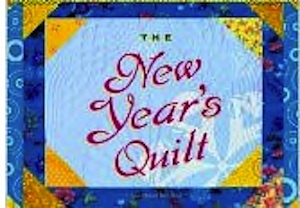 I recently picked up this book "The New Year’s Quilt" by Jennifer Chiaverini. I have just finished reading it and it is a lovely light read. If you have read any of the Elm Creek Quilts Novels, it continues the story of Sylvia who runs the Elm Creek Quilting Retreat. Not only do you learn about the challenges she now faces and how she handles them, but you also read about her childhood and how quilting fit into all of her life. One thing I particularly like is how the author explains different quilts and the blocks used to make the quilts. Also, the book’s jacket is a paper “quilt” and is even embossed so you can feel some of the different pieces of the quilt. Plus, the inside cover of the book shows the blocks Sylvia is using in her “New Year’s Quilt". I thoroughly enjoyed this book, and I think it would make a wonderful stocking stuffer. 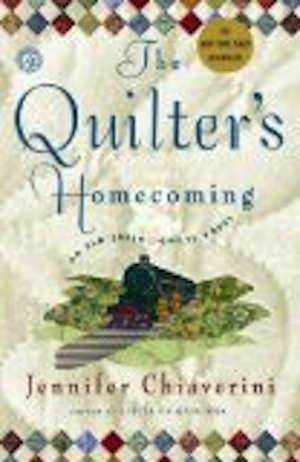 "The Quilter's Homecoming" is another excellent novel by Jennifer Chiaverini! This story chronicles the journey of newlyweds Elizabeth and Henry as they cross America to their newly purchased ranch in California. and the subsequent unfolding months is intriguing and inspiring. I love how Jennifer weaves quilting traditions into her stories, and I highly recommend this one! I’ve just read two of Jennifer Chiaverini’s books. The first one is called “The Master Quilter” and carries on the story of Elm Creek Quilts. Each chapter is about one of the quilters involved with the running of Elm Creek Quilts and how their lives are intertwined. Although each quilter has a different life to live, I found it a little repetitious because each of the quilters goes to the same meetings and works on the same project, a quilt for the “Grand Master Quilter” Sylvia. The effect reminded me of the movie “Groundhog Day”, where the day started over and over again. I got through it and enjoyed the ending, but found it a little boring. The second book, “Circle of Quilters” carries on with the Elm Creek ladies, and is written in a similar style although it keeps your attention much better. Elm Creek is in need of two teachers, and each chapter is about one of the applicants for the position. This was definitely more interesting and I look forward to the next book with the new quilter teachers involved. The inside cover of all Jennifer’s books show multitudes of quilt blocks, which is just a bonus!! I read a really good book recently by Emilie Richards. The book is called “Wedding Ring”. It is an intriguing story about three generations of women in one family, and the author always centers her stories around a quilt, in this case a Double Wedding Ring quilt. The quilt was started by Grandma, passed on to her daughter, and the granddaughter ends up repairing it many years later, all of course accompanied with the story of each of their lives. It is a very touching and a good read!